If you've followed the news coming out of the Pope & Young Club this year, you'll remember that the archery record keeping organization has been on a roll in 2014, announcing several new world’s records. If scoring by a panel judging group at next year's April 15-18, 2015, Pope & Young Club convention in Phoenix, Ariz., affirms some of the club's most recent news, then add another record animal to that list. That's because just over a year ago, on Sept. 5, 2013, Newfoundland, Canada, resident Jeff Samson began a spot and stalk attempt on a woodland caribou bull, the likes of which the outdoor world has never seen. By the stalk's end, Samson was in position to slip an arrow through the huge bull's vital organs. When he cut the shot, the archer did just that. What the Canadian bowhunter recovered at the end of that particular blood trail was nothing short of fantastic, a woodland caribou bull that stands poised to shatter – shatter – the current P&Y world’s record for the species. The current world’s record - a 345 2/8-inch bull killed by Dempsey Cape in 1966 – has stood for 48 years. The mounted specimen, on display at the Pope & Young Club's "Museum of Bowhunting" at its Chatfield, Minn., headquarters, is one of the Club's longest standing benchmarks. But that nearly half-century reign stands to end – pending panel judging next spring – thanks to the Samson bull killed just over a year ago. With a current entry score of 376 7/8 inches, the Samson bull is poised to run by the existing world record mark by a stunning 31 inches. 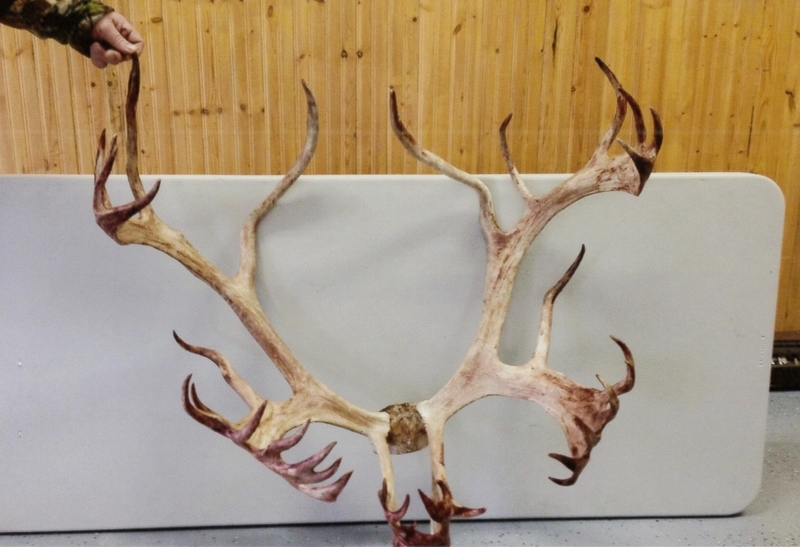 Is the Samson bull a sure-fire lock to grab the woodland caribou's world’s record throne? It would seem that way at the moment. While there could be some change from the current official entry score to the final panel judging score due to shrinkage, an initial mishandling of the measuring chores, scoring rule interpretations, etc., it would be highly unusual for an animal to lose 31 inches upon panel judging. The smallest of the five caribou sub-species accepted by the P&Y record program (barren ground caribou, mountain caribou, Central Canada barren ground caribou and Quebec/Labrador caribou are the other four), woodland caribou are a big game species found only in sustained and huntable numbers in the Canadian province of Newfoundland. Even so, the Samson bull is as impressive as a bow-killed caribou can get anywhere in Canada or Alaska. Currently a part of the Club's ongoing 29th recording period, which runs from Jan. 1, 2013 through Dec. 31, 2014, the Samson bull will be among 100 or so big game specimens invited to the Club's panel judging session next spring. According to P&Y, panel judging is the process that the Club uses for verification of the final scores of antlers, horns and skulls of the highest ranking North American big game specimens entered into the Club's records during that two-year recording period. The special scoring session will be done by a group of hand-picked official measurers for P&Y, a group that the Club says will consist of some of its most highly knowledgeable and experienced measurers. Should the Samson bull pass their panel scoring muster next spring, the bull will then be declared a new world's record and will be recognized by Pope & Young at the 2015 biennial convention and awards banquet.